Are you managing your social media accounts with Hootsuite? Do you know you can use their dashboard for reporting? Using one tool to manage and report on your social media activities can save you valuable time. In this article, you’ll discover how to run social media reports inside Hootsuite. 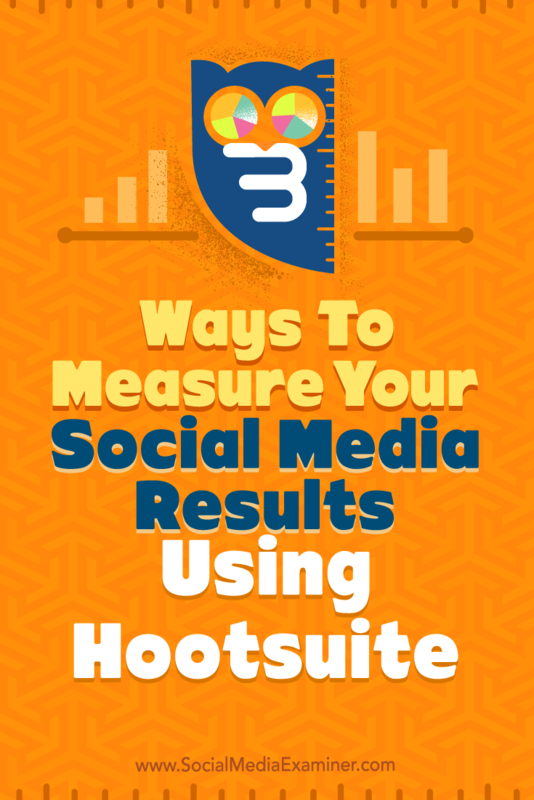 Discover three ways to use Hootsuite to measure your social media results. 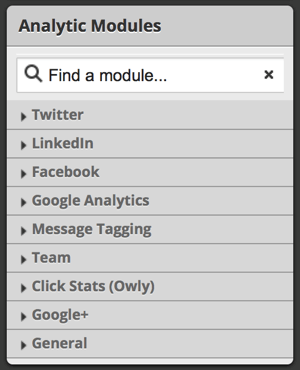 To find the template reports in your free Hootsuite account, log into your dashboard and click on the analytics icon on the toolbar on the left of the screen. Click on the analytics icon on the left. Here, you’ll see a list of template reports. Keep in mind that not all of these templates are available to use with a basic, free Hootsuite account. Hootsuite provides a variety of templates to create reports for your social media accounts. Here are the reports that are free to use. With a free account, you can create up to two basic reports. This template tracks your Twitter follower growth over time, important keyword mentions, and your most popular Ow.ly links. It’s great if you want to generate a basic report on your Twitter profile development on a regular basis. 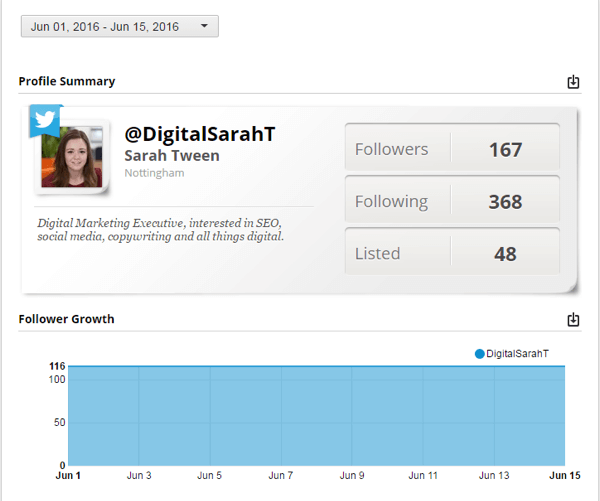 The Twitter Profile Overview is great for tracking growth over time. 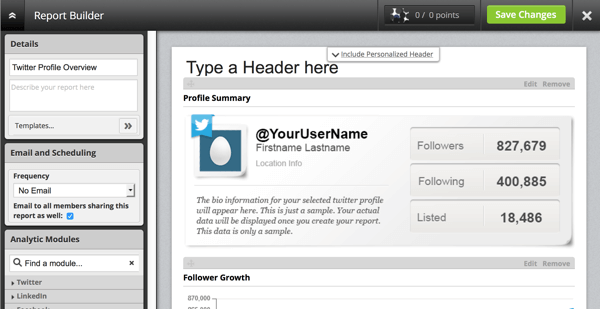 To generate the report, select the report owner and the Twitter profile you want to report on, and click Create Report. Select the report owner and click Create Report. Once the report is generated, you can use the drop-down menu at the top of the report to edit the report’s date range. In addition, you can export this report to either PDF or CSV format, print it directly from Hootsuite, or share it with your colleagues. These options are available in the toolbar at the top right of your screen. Exporting or sharing your report is easy. With the Facebook Page Overview template, you can see a summary of the performance of your Facebook business page, including your daily likes and feedback on your updates. This template is useful because it will track new likes against marketing activities and lets you see which of your updates have helped grow your audience. Running this report monthly gives you a good overview of how things are going with your Facebook business page. 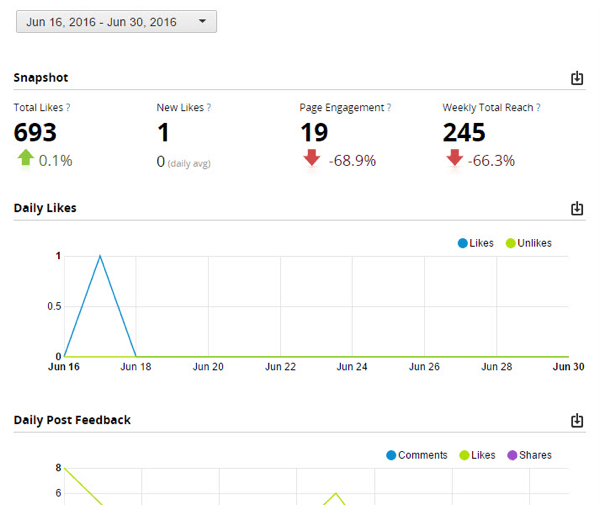 Track new likes with marketing activities to see what’s working on your Facebook business page. If you create the Ow.ly Click Summary report, you can see your click statistics for any Ow.ly links you’ve used in your tweets. The report includes the number of clicks per day, your most popular links, and clicks per region. The URL Click Stats template differs from the others. 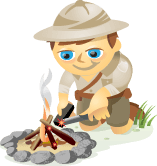 This report lets you search for specific Ow.ly links and retrieve click data for them. You can choose a particular Ow.ly link to get specific data on that link. This could be useful if you need to track the number of clicks for a particular campaign. 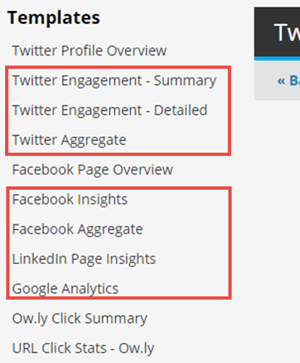 Paid Hootsuite accounts include the other template reports listed in the Analytics section. These templates work on a point system; that is, each template will cost you a certain amount of points to view the report. The number of points is based on which paid package you chose. Hootsuite paid packages include additional reports for Twitter profiles and Facebook pages. Twitter Engagement – Summary (50 points): This report tracks Twitter follower growth, mentions, and retweets. Twitter Engagement – Detailed (50 points): This template looks at the same metrics as the Summary version but in more detail. The Twitter Engagement – Detailed report expands on the Summary report. Twitter Aggregate (Enterprise account only): This template compares Twitter accounts, which is helpful if you have more than one Twitter profile for your business. Facebook Insights (30 points): This report outlines engagement rates for your Facebook updates, fan demographics, and the overall performance of your page. The Facebook Insights report provides information about the performance of your Facebook page. Facebook Aggregate (Enterprise account only): Similar to the Twitter aggregate report, this allows you to compare Facebook pages. LinkedIn Page Insights (20 points): This template summarizes the performance of your LinkedIn company page. It looks at followers, post impressions, and levels of page engagement. Google Analytics (50 points): This template outlines important Google Analytics, including website traffic, sources, and your most popular content. From the Analytics screen, click on Build Custom Report under Customize. 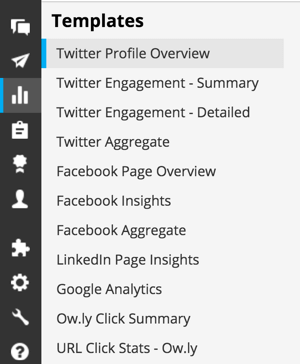 Hootsuite lets you build custom reports. Alternatively, from within any report template, click on the edit icon, which will take you to the Report Builder screen. You can edit report templates, too. 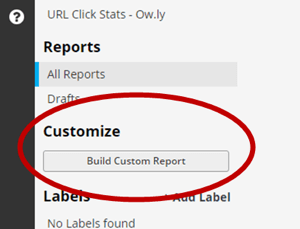 If you click the Build Custom Report button, you’ll need to either choose a report template (which you can edit), or build a custom report from scratch. After you click Build Custom Report, you’ll need to select a template. If you click on the edit icon within a report template, you’re taken to the Report Builder screen with this template loaded and ready for you to edit. After you click the edit icon within a report, you’ll see options to customize the report. In the Report Builder, you can use the Analytic Modules menu to edit existing modules, remove them from your template, or add new ones. Note: the points system still applies; you’ll need a paid account to access some of the modules. You can edit, add, or remove analytic modules. There are some clear benefits to building your own custom reports. For example, you can upload your own image or logo to personalize your reports, or add contact info. Add logo and contact information to personalize your reports. You can also set up a schedule to email the report to other people on a regular basis. 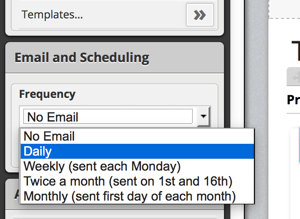 Choose the frequency to email the report to colleagues or partners. In addition, a custom report will let you generate and schedule a single document that reports on your Twitter and Facebook accounts. Upgrading your Hootsuite account to a paid plan gives you access to a wide range of additional features, including enhanced reporting. With Hootsuite Pro, you can create up to three basic reports and one enhanced report, which is the equivalent of 50 analytics points that you can use to purchase modules. You can purchase an additional 50 points for $50 per month, up to 400 points. Hootsuite Business offers all of the Pro features plus real-time analytics reporting. Hootsuite Enterprise provides unlimited basic reports and unlimited enhanced reports, as well as access to advanced reports. If you decide to use Hootsuite for reporting, the type of account you’ll need usually depends on the size of your business and the scale of your social media activity. If you already use Hootsuite to manage multiple social media profiles, the reporting features will help you streamline your processes and improve your social media marketing. What do you think? Do you use Hootsuite to create reports for your Twitter profile and Facebook page? What insights have you gained? Please let us know in the comments below! 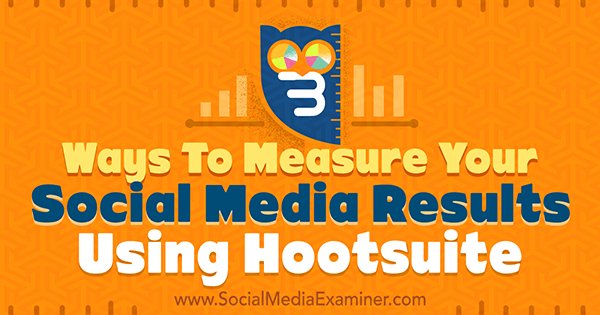 Tips on three ways to measure the results of your social media using Hootsuite. Sarah is a Digital Marketing Executive at Hallam Internet, a full service Digital Marketing agency in Nottingham. Sarah specializes in Social Media for B2B companies.